Update: A couple of useful links and a popular article on the subject. I just learned of the discovery of Comet ISON which has apparently electrified the astronomy world for months. What then caught my eye was a paper from David Eichler of Ben Gurion University published just two months later and curiously does not mention the newly discovered body. Rather, Eichler investigated the effects of a comet the size of Hale-Bopp plunging into the sun. The result according to Eichler would be a huge solar disturbance which could perhaps explain the spike in radiocarbon at 775 AD. If it were high I would be forced to drop my regular aversion to forward catastrophism and admit the day was truly nigh. I am also fascinated with the seemingly genetic relationship between the orbits of ISON and Newton’s Great Comet of 1680. From what I understand of comets, which is little compared to many Tusk readers, the orbital period should be relatively long because the motion of the object is relatively parabolic. I have seen mentioned that the orbital period of ISON should be something around 10,000 years (an interesting timescale to Tusk readers). 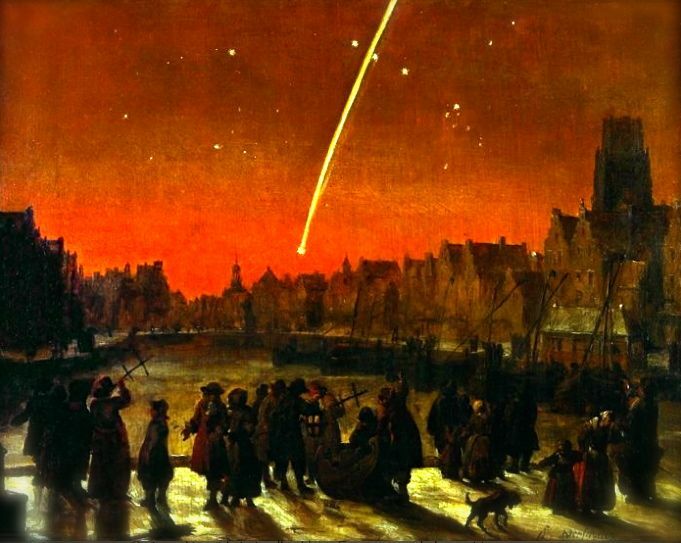 But other articles seem to suggest that the Comet of 1680 and this comet may be separate pieces of a much larger body from the Orrt Cloud, sending chucks our way now and then. Instructive in its own way. I’m interested in reader insights as always.